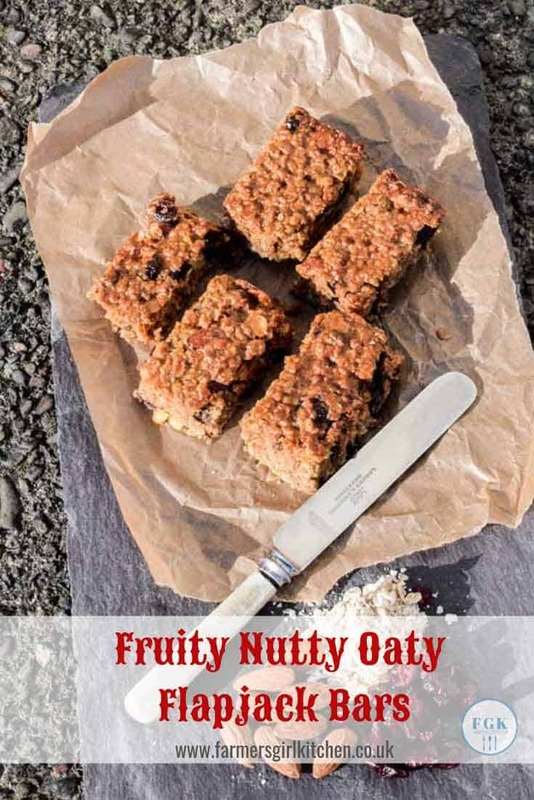 Fruity, Nutty, Oaty Flapjack Bars are easy to make and brilliant for filling lunch boxes and cake tins. Best of all they are endlessly adaptable to the ingredients you have in your larder. This recipe includes two bananas, peanut butter, dried cranberries, pistachios, and almonds, but any dried fruit and nuts will do, or you can use seeds. You can make the Flapjack Bars with butter or go dairy-free with coconut oil. 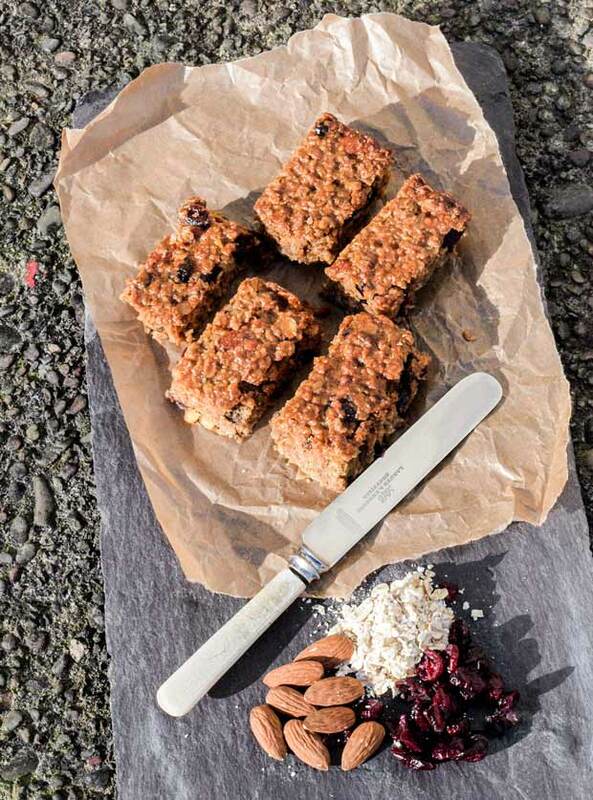 The Flapjack Bars may not be a low-calorie snack, although you can cut them into smaller slices. 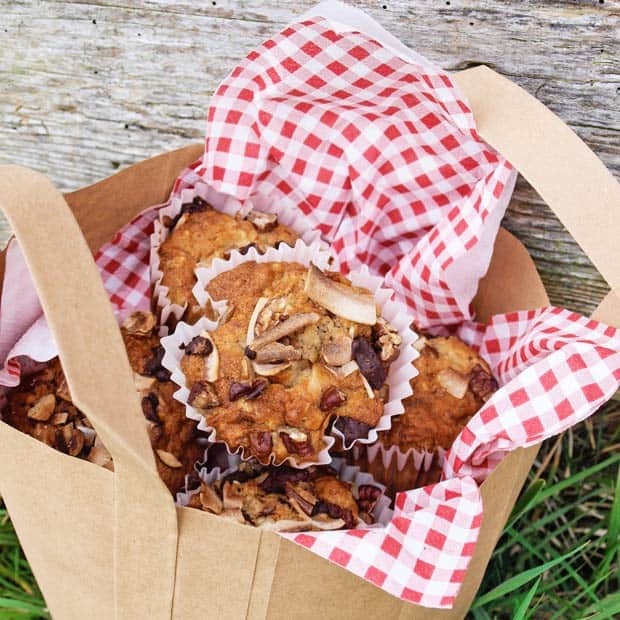 However, they are ideal to add to a lunch box or take on a long walk or picnic as they are packed full of energy. If you read the ingredients on most commercial flapjack bars you will be horrified at just how processed they actually are. At least if you make them yourself you will know exactly what you are eating. A soft and chewy bar cookie, filled with dried fruit and nuts, ideal for lunch boxes or as a tasty snack. 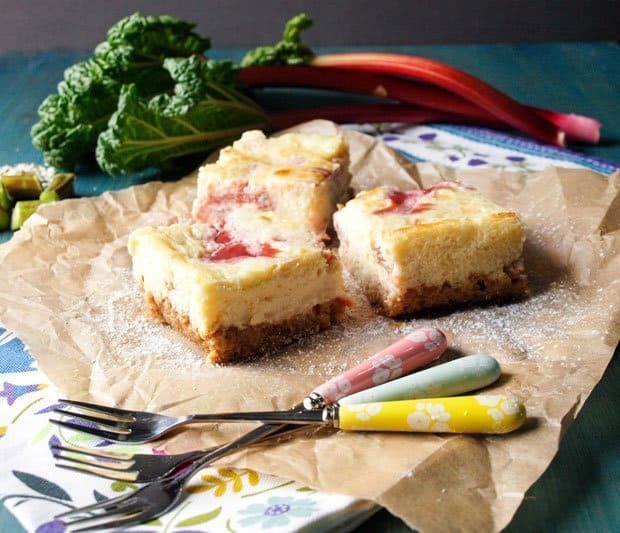 Put butter or coconut butter, peanut butter, sugar, agave syrup and citrus fruit zests in a pan and heat gently until the sugar has dissolved. Mash the bananas and add to the mixture. Put all the dry ingredients in a large bowl, add the wet ingredients and stir until thoroughly mixed. Press the mixture into the tin. Add the peanut butter, sugar, agave syrup and zests to the ThermoCook jug and set to stir level 3 at 80C for 4 minutes until the sugar has melted. Continue as per directions above. I used my Optimum ThermoCook to mix and melt the wet ingredients. The Thermocook is a multi-function kitchen appliance. 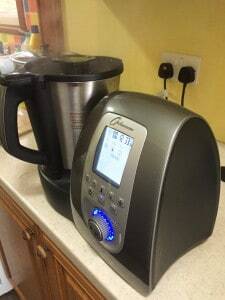 If you’d like to find out more about the ThermoCook you can read my review or visit the ThermoCook website. It’s an amazing piece of kitchen kit that I use all the time, it has largely replaced my food-processor and blender. The ability to control the temperature and have integral stirring makes it invaluable for cooked recipes like sauces, curds, and custards. 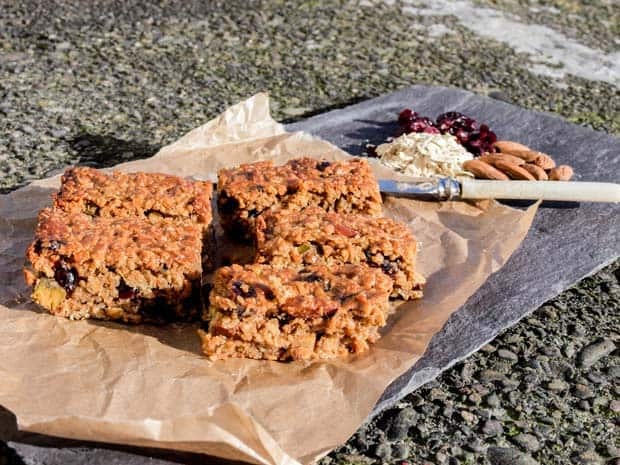 I’m adding this recipe for Flapjack Bars to the Credit Crunch Munch Linky as it’s made from ingredients in the larder and, not only tastes better but is a cheaper alternative to bought flapjacks and snack bars. Credit Crunch Munch is devoted to thrifty recipes and is run alternately by Helen at Fuss Free Flavours and Camilla at Fab Food 4 All. Disclosure: This post contains affiliate links. Buying an Optimum ThermoCook through a link costs the same as buying it direct from Froothie, however if you do use the link, I will receive a small commission, this helps me to maintain Farmersgirl Kitchen and bring you more recipes and reviews. That was quick, Camilla! Always a pleasure to join CCM. Oh Janice,these look scrummy! Love the addition of crunchy peanut butter. Thanks Kellie, I’ll need to start making my own peanut butter like Camilla! Haha, snap Janice. I made peanut butter flapjacks a couple of days ago – not in my Thermocook though. I’ve never used peanut butter in flapjacks before and now I’m wondering why ever not – they are delicious. Yours look perfect. Thanks Choclette, I think the peanut butter creates a great texture, not too chewy as some can be. 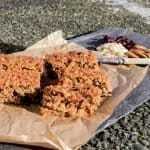 I do love a good flapjack and this batch looks very tasty and just the job to accompany a culpa. Thanks Karen, indeed they are excellent with a cup of tea or coffee. 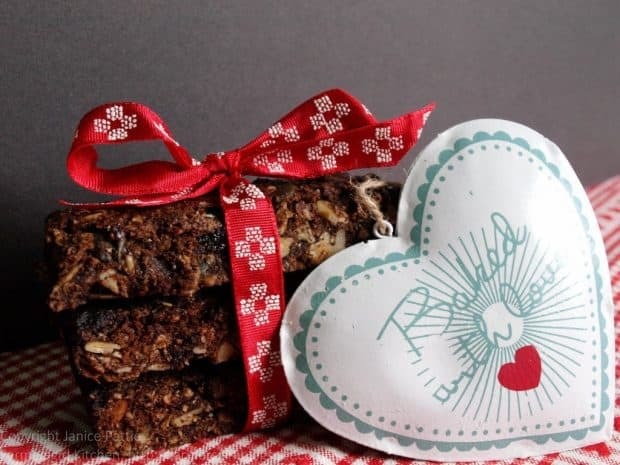 These flapjacks look amazing! As we may have a peanut allergy in our youngest, I will try them with almond butter instead. Love flapjacks and using the Thermocook to make them sounds so convenient! Thanks Lucy, I’m sure any kind of nut butter would work equally well. These look so lovely Janice! Haven’t tried flapjacks in my ThermoCook but what an excellent idea, will definitely be giving this a try. Thanks Kate, so many uses for the ThermoCook! I love carrying some home made flapjacks when we go on our long weekend strolls, these look so yummy and the gizmo seems to make a quick job of it , such a cool piece of equipment! Thanks Manjiri, these are ideal to keep you going on a walk or day out and really easy to make.